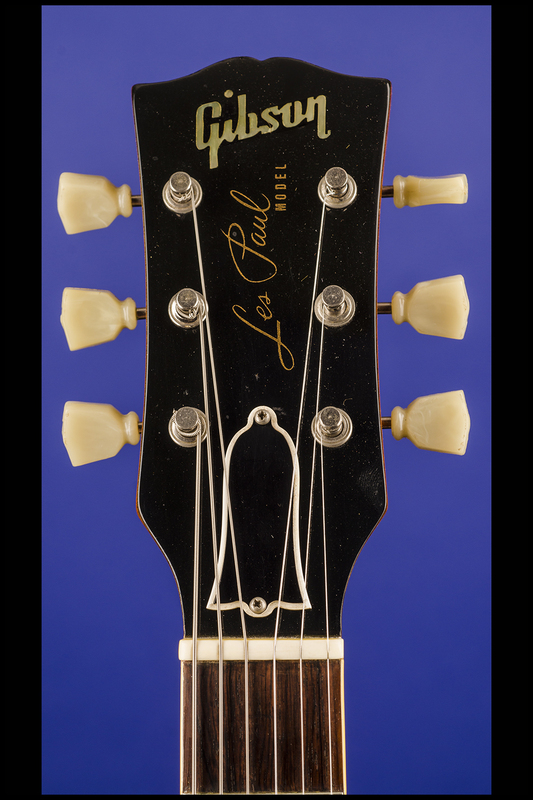 Les Paul Standard PAF Gold Top Guitars | Fretted Americana Inc.
Every Part Original - Down to the Very Last Screw! Single cutaway solid body. This guitar is very similar to Dickey Betts 'Goldie'. One of the very early 1958 PAF Goldtops, this guitar weighs just 8.40 lbs. and has nice, fat nut width of just under 1 11/16 inches and a standard Gibson scale length of 24 3/4 inches. 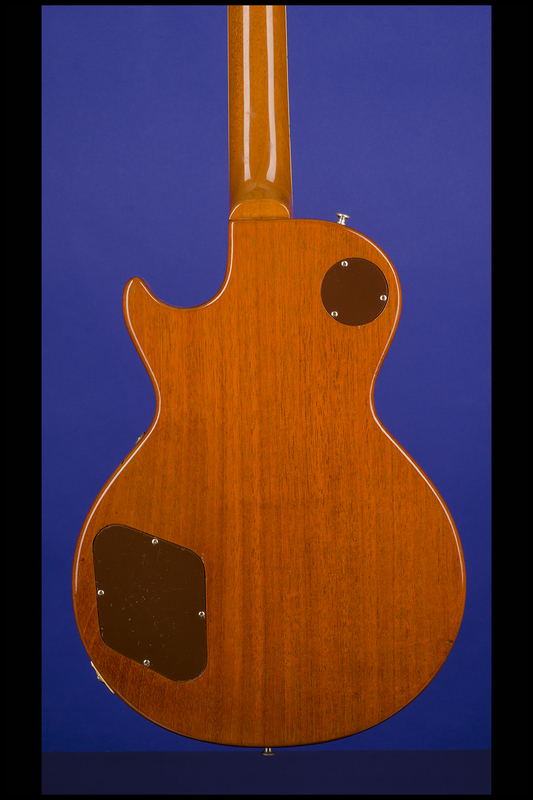 Solid mahogany body with a solid carved maple top. One-piece mahogany neck with a wonderful medium profile, and Brazilian rosewood fretboard with 22 original thin frets and inlaid pearl trapezoid (crown) position markers. Headstock with inlaid pearl "Gibson" logo and "Les Paul Model" silkscreened in gold. Two-layer (black on white) plastic truss-rod cover. The serial number "8 1791" is inked-on in black on the back of the headstock. The top of the guitar has single-ply cream binding and the fretboard has single-ply cream binding. Individual single-line Kluson Deluxe tuners with single-ring tulip-shaped Keystone plastic buttons (stamped on the underside "D-169400 PATENT NO."). Two PAF humbucker pickups (double-black) with outputs of 7.33k and 7.83k. Both pickups with the small rectangular black label on the underside with "Patent / Applied For" in gold lettering. The cream neck pickup mounting ring is stamped on the inside "MR491" and "M-69 7" and the cream bridge pickup mounting ring is stamped on the inside "MR490" and "M-69 8." Single-layer cream plastic pickguard. Four controls (two volume, two tone) on lower treble bout plus three-way pickup selector switch on upper bass bout. Gold plastic bell-shaped "Bell" knobs. 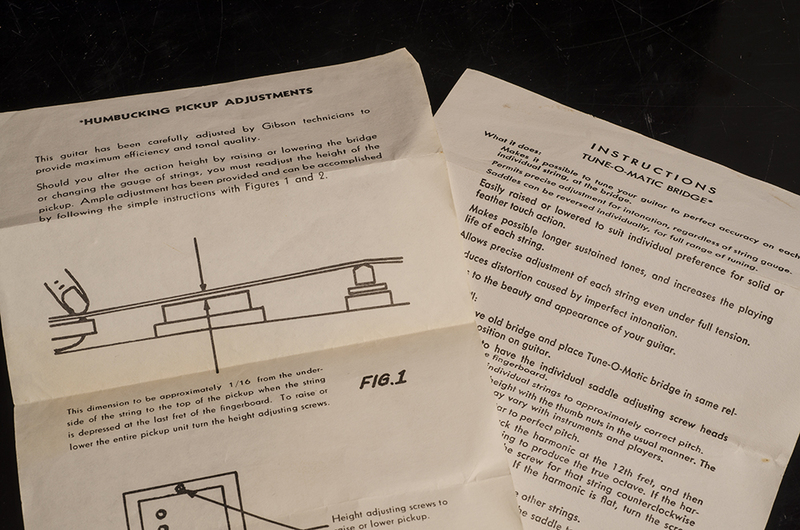 The potentiometers are stamped "134 649 & 134 701" (Centralab December 1956 and January 1957). Two original "Bumble-Bee" capacitors. With the original black plastic control cavity plates. ABR-1 non-retainer Tune-O-Matic bridge with metal saddles and separate stud tailpiece. This incredible guitar was re-finished by Tom Murphy in 1995. 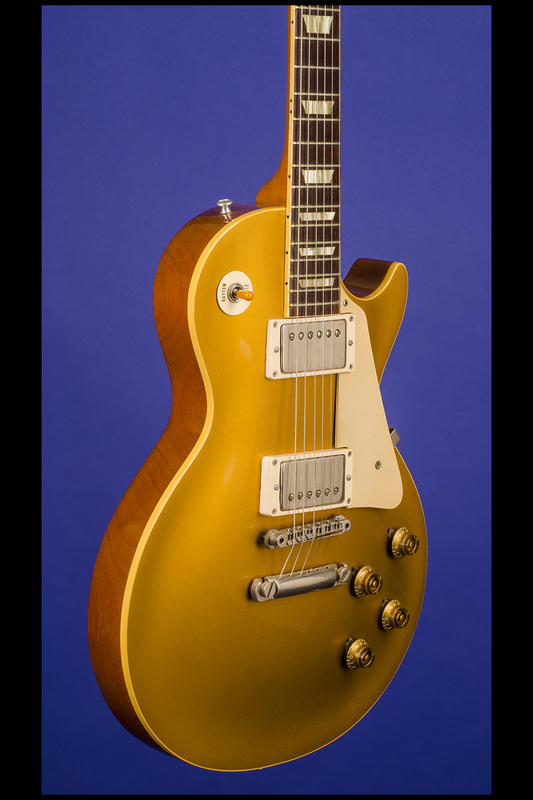 This is one of the very last of the Les Paul Gold Tops, we have seen Gold Top serial No. "8 2700" and we know from Yasuhiko Iwanade's book The Beauty of the 'Burst that serial No. "8 3096" is a 'burst which is now owned by Slash. This guitar plays, sounds, and looks phenomenal, and is in exceptionally fine (9.00) condition. Housed in the original Gibson "Stone Case Co. Brooklyn N.Y.") brown five-latch hardshell case with pink plush lining (9.00). 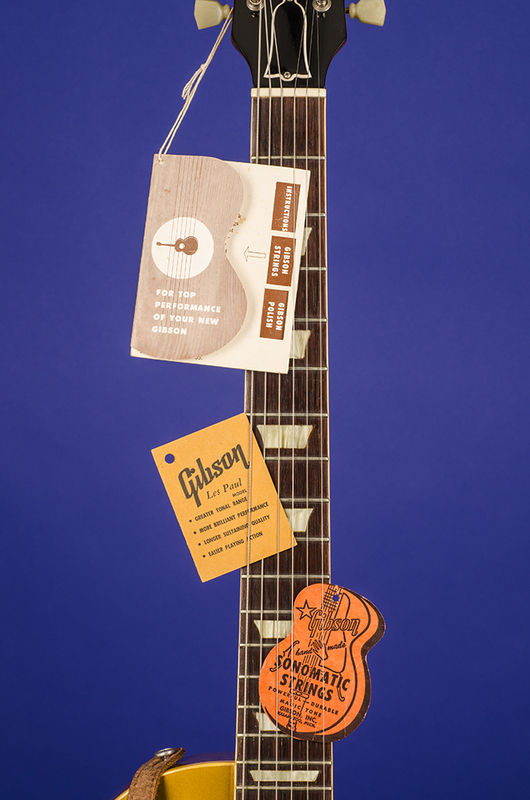 Included with the guitar is the original brown leather strap; the original Gibson folding hang tag with "Les Paul" stamped in blue; the original "Humbucking Pickup Adjustments" sheet; the original "Instructions Tune-O-Matic Bridge*" sheet, and also three original tags: "Sonomatic Strings", "Professionals Attention" and folding "Gibson Les Paul Model". This guitar was re-finished in 1995 by Tom Murphy replicating perfectly the original finish. The previous owner (Dr. Franklin Green) had purchased the guitar from a music store in Huntington Beach in 1966. At that time the 'original' owner had painted the top in orange. Having owned the guitar for nearly thirty years Dr. Green decided to ask Tom Murphy who had just left Gibson in Kalamazoo to re-finish the guitar back to original specification. According to the Dr. Green and Tom Murphy this was the very first "full restoration piece done in my shop as Guitar Preservation". 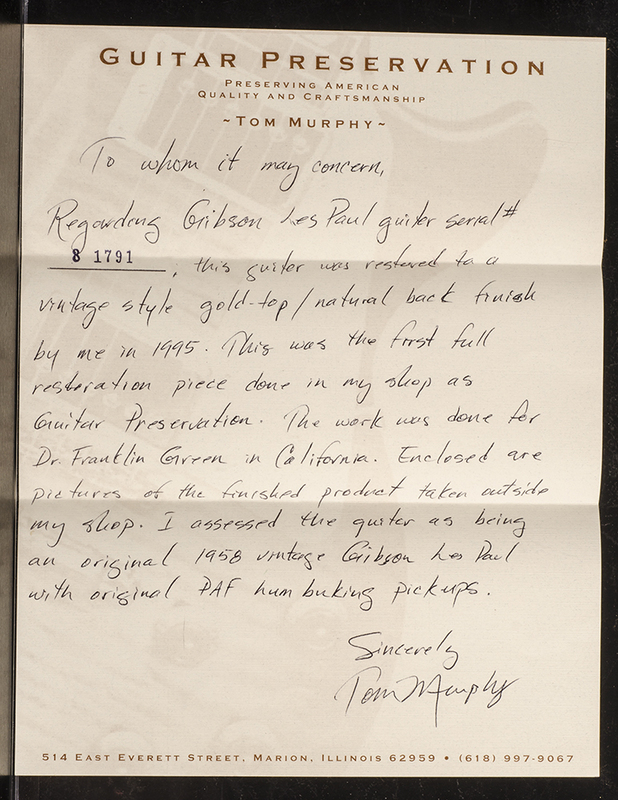 Included is a hand written letter written by Tom Murphy in 1995 on "Guitar Preservation" headed paper (in the original "Guitar Preservation" envelope with matching serial number stamped in black: "To whom it may concern,/Regarding Gibson Les Paul guitar serial #/ 8 1791 [stamped in black] , this guitar was restored to a /vintage style gold-top / natural back finish/by me in 1995. This was the first full/ restoration piece done in my shop as/Guitar Preservation. The work was done for Dr. Franklin Green in California. Enclosed are/pictures of the finished product taken outside/my shop. I assessed the guitar as being an original 1958 vintage Gibson Les Paul/with original PAF humbucking pickups./Sincerely/Tom Murphy". We have taken the guitar completely apart and can confirm that every single component down to the last screw is (with the possible exception of the cream plastic jack-plate) original to the guitar. The only anomaly on the guitar is four small expertly filled holes (under the re-finish) around the jack plate - (we would guess that the original owner had broken the cream plastic plate and had fitted a large and stronger one in it's place - or possibly just decided to fit a larger stronger plate to the guitar). The jack plate now on the guitar is either the original or a supplied 1958 example. 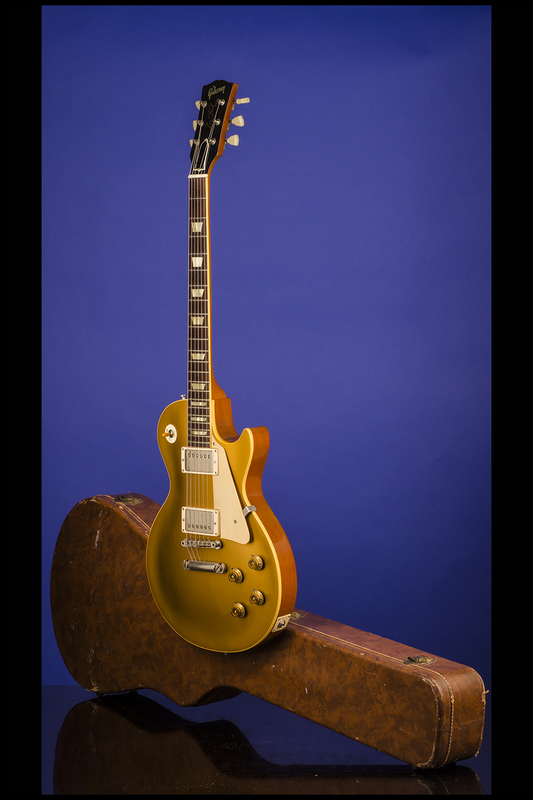 There were approximately 750 Les Paul Gold Tops with PAF's shipped between 1957 and early 1958 compared with around 1,600 Les Paul Standard 'Bursts shipped between 1958 and early 1961. 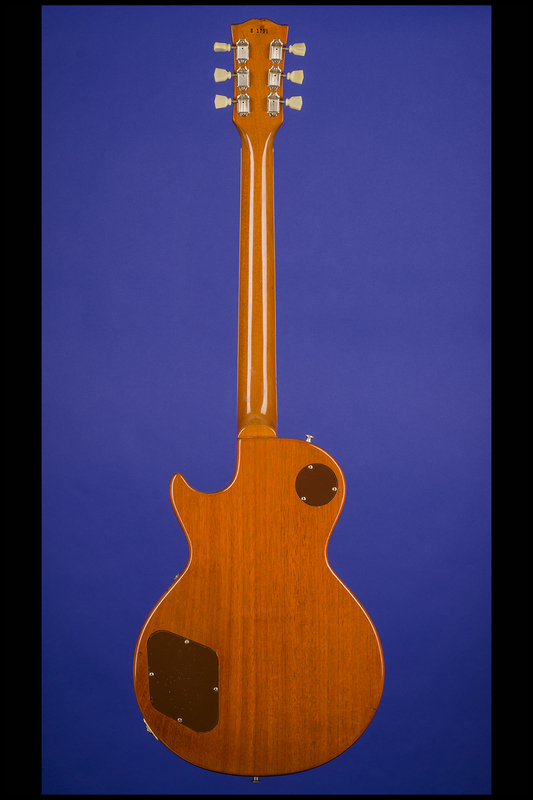 "Finishing the maple top was a completely different process than that for mahogany. Due to the smooth nature of the dense maple, the wood didn't need a filler coating, but needed to be properly prepped. The tops received a few initial, thinned-out lacquer sealer coats that were lightly sanded and readied for the final finish. "On the Goldtop, they would put what they called a sealer on it," states Gibson's Aaron Porter, "which was just thin lacquer kind of thinned out. They put maybe two coats and then sanded it. They made sure there wasn't any pits or anything on there because it would show up underneath in the gold. If there was a scratch or groove, it would show right up. The gold lacquer mixture was then sprayed once or twice to make sure it was well covered." The bronze powder was pre-mixed into the clear nitrocellulose lacquer for these classic models. The paint department soon discovered that the brass filings in the mixture were quite obtrusive… Seeing how the oxidation of bronze turns green, often worn and weather-checked instruments show green in the lines, adhered to the prep coats, and also in some of the sealing topcoats. Unfortunately, the bronze/gold color under the finish didn't stand up too well to the rigors of constant use, it would often pit or become somewhat rough on the necks and top edges." (Rob Lawrence. The Early Years of the Les Paul Legacy, p.68). "The new Les Paul guitar was launched by Gibson in 1952, in the summer, priced at $210, which was about $20 more than Fender' Telecaster sold for at the time…Today, a gold-finish Les Paul model is nearly always called a gold-top thanks to its gold body face…The new gold-top's solid body cleverly combined a carved maple top bonded to a mahogany base, a sandwich that united the darker tonality of mahogany with the brighter sonic 'edge' of maple. 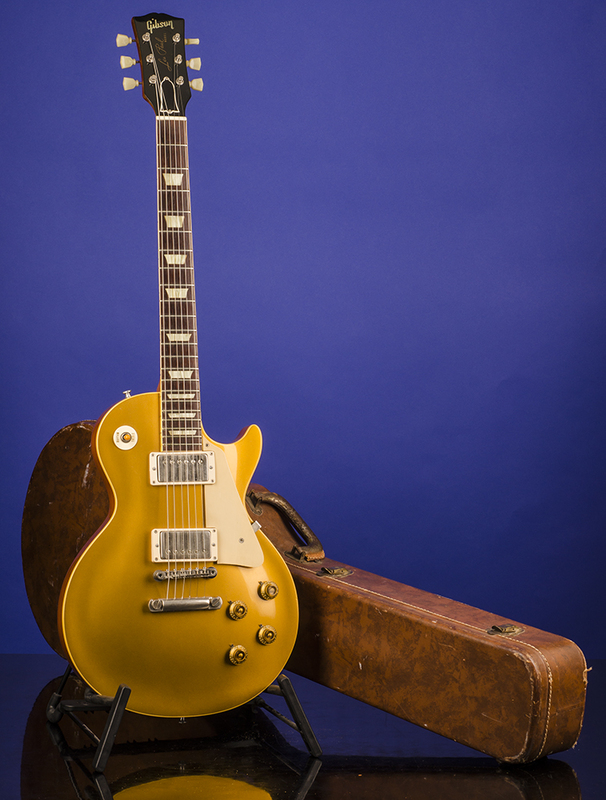 Paul said that the gold colour of the original Les Paul model was his idea. 'Gold means rich,' he said, 'expensive, the best, superb'" (Tony Bacon, 50 Years of the Gibson Les Paul, pp. 20-21). "In 1955 the gold-top gained Gibson's new Tune-o-matic bridge. The unit had the facility to adjust individual string-length, improving intonation. 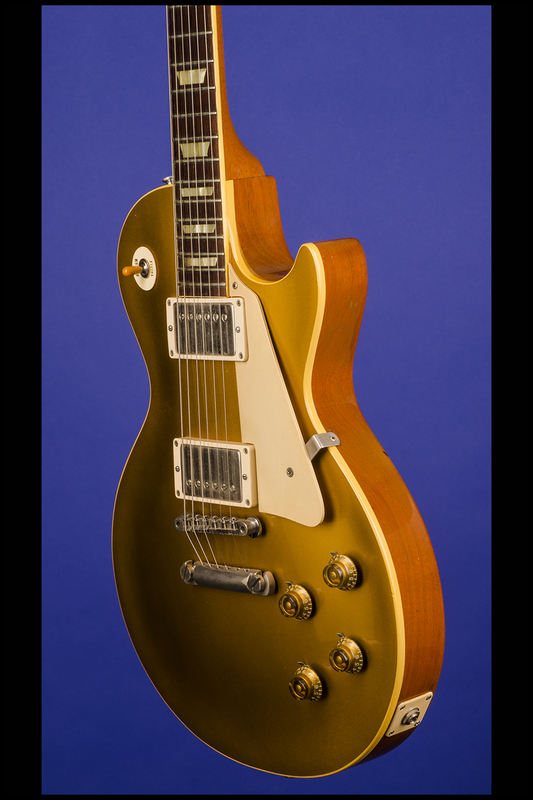 Two years later humbucking pickups replaced P90s on the gold-top" (Tony Bacon and Paul Day, The Gibson Les Paul Book, p. 19). 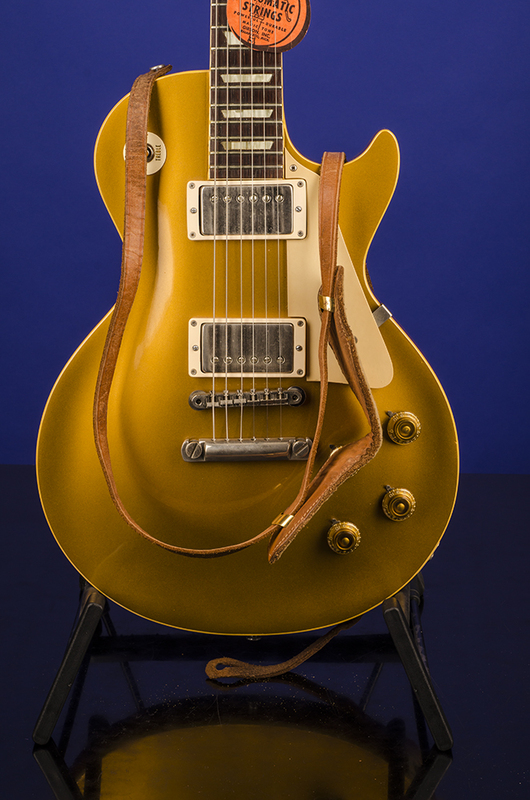 "Humbucking PAF pickups replace P-90 pickups around serial number '7 2000' to '7 3800' range (latest 1957 goldtop documented with P-90s is serial number '7 38xx', and the earliest is a leftie PAF goldtop '7 13xx'). 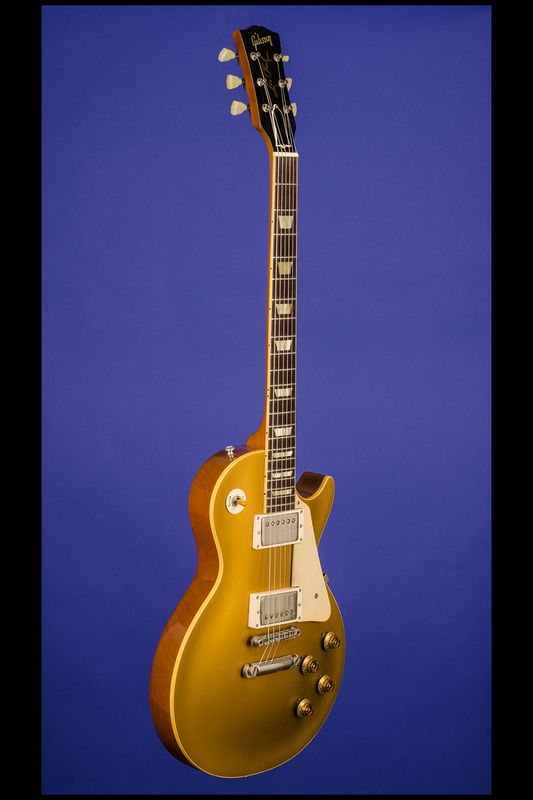 During this period there was definately overlaps of Goldtops with either P90 or PAF pickups. First few months of humbucker pickup production used brushed stainless steel pickup covers (instead of nickel plated covers) with no PAF stickers. Resistance of the new pickups ranged from 7.0k ohms to 8.9k ohms. 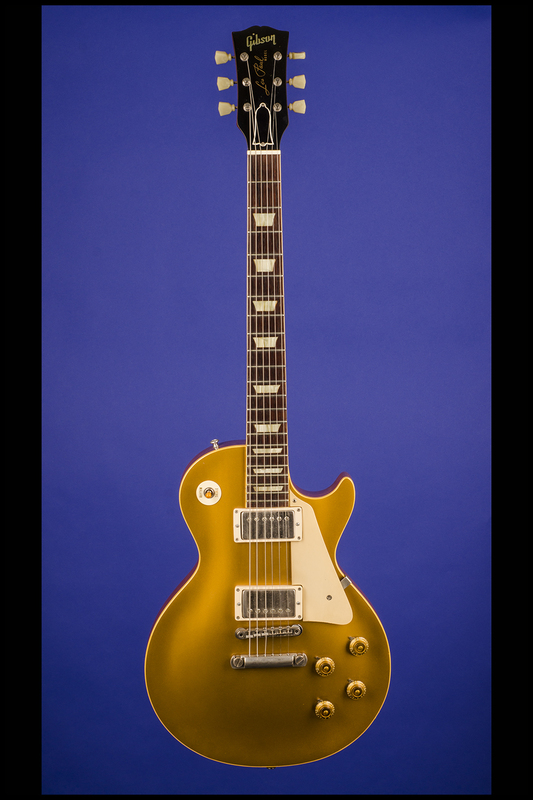 The first month of humbucker Les Paul goldtop production used black plastic parts (pickguard, pickup rings, switch surround), with black parts ending by about serial number '7 32xx'. All black plastic 1957 Les Paul Goldtops should have a dark back (if it doesn't, chances are someone stole the cream parts and replaced them with black parts). Within a month or two, PAF goldtops changed to cream plastic parts (cream part PAF goldtops not seen before serial number '7 3000'). Generally speaking black plastic part 1957 Les Paul goldtops are worth less than cream part 1957 goldtops though. The black and cream plastic humbucker pickup mounting rings had 'M-69' as part of the molding, on the bottom side between the height adjustment screw and mounting screw. Also the plastic humbucker rings had four 'screw tunnels' for each mounting screw (but not for the two pickup height adjustment screws). Though the M-69 pickup surrounds were used until about 1970 (in black, when they were replaced by the M-8 pickup rings with no screw tunnels), Gibson did not use cream colored M-69 pickup rings any later than 1960. That's why there's such a big deal about original cream-colored 1950s Les Paul pickup rings, because original M-69s in cream were unavailable after 1960. Though these seems like minor details, original plastic parts are important to these guitars" (http://www.provide.net/~cfh/gibson5.html#lpstd). In 1958, the "model name changed from 'Les Paul Model' to 'Les Paul Standard'. 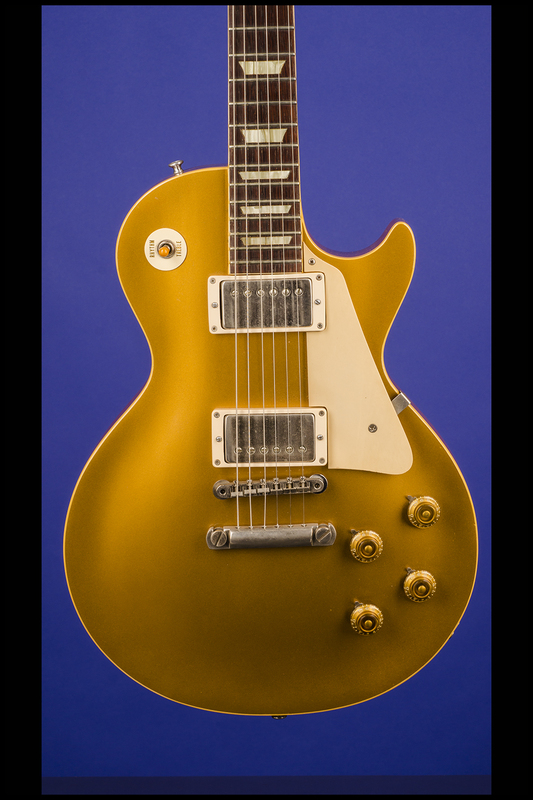 Sunburst finish replaces Goldtop finish in the fall of 1958, around serial numbers in the '8 5300' range (though the first known Sunburst Les Paul has serial number '8 3322'). 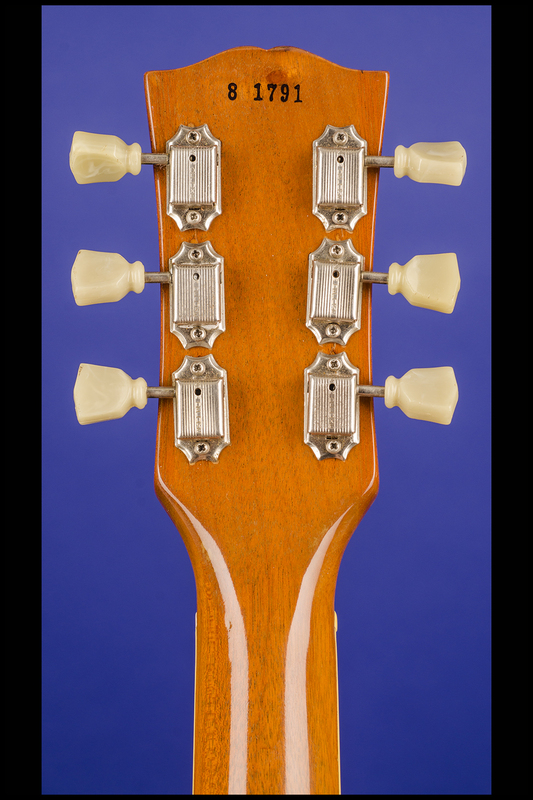 The maple top on a 1958 to 1960 Sunburst Les Paul is always two pieces and 'center seamed' (there is NO exception to this rule, except for one of the first 1958 sunburst Les Pauls with serial number '8 3322'; if a Sunburst Les Paul does not have a two piece center seamed maple top, it is a refinished Goldtop!) Most 1958 Sunburst Les Pauls came with a brown 'california girl' case with a pink lining and four case latches. 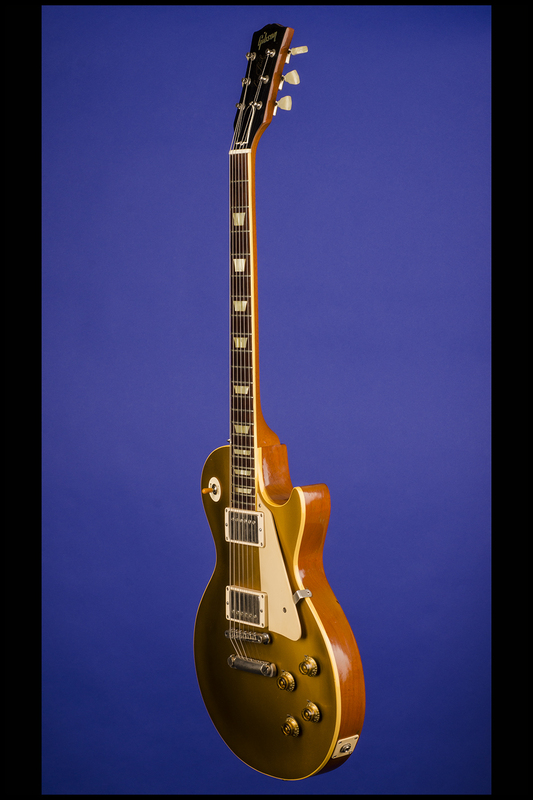 But by the end of 1958 the cases changed slightly to have five latches, and this 5-latch brown case is known as the defacto-standard Sunburst Les Paul case" (http://www.provide.net/~cfh/gibson5.html#lpstd).